Preet Bharara, the U.S. Attorney for the Southern District of New York, explains the major insider trading case announced earlier this month. NEW YORK (CNNMoney) -- It's known as "Operation Perfect Hedge": the government's unprecedented crackdown on insider trading that's led to nearly 60 convictions since it began roughly two and a half years ago. And with the charges announced two weeks ago against men from some of the country's largest hedge funds, it shows no sign of slowing down any time soon. Earlier this month, law enforcement officials announced the indictment of four investment professionals on insider trading charges, including Anthony Chiasson, who co-founded the Level Global hedge fund in 2003, and Todd Newman, a former portfolio manager at Diamondback Capital. Three others have pleaded guilty and are cooperating with the government in the case, including former analysts from Diamondback and Level Global. All told, the government has brought criminal charges against 63 people in its current crackdown and has secured 56 convictions, Preet Bharara, the U.S. Attorney for the Southern District of New York, said at a press conference announcing the new arrests. He compared the case in scale to that of Raj Rajaratnam, the hedge fund manager who received a record 11 years in prison last year after earning $64 million in a long-running insider trading scam. 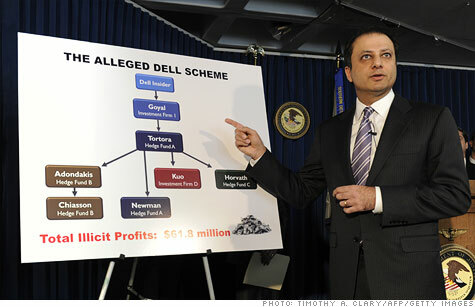 Analysts say the government's momentum in insider trading cases stems from a renewed focus on the practice as well as the use of investigative techniques, particularly wiretaps, previously reserved for other kinds of crime. Treating traders like the mob: The Rajaratnam case was "the first time that court-authorized wiretaps have been used to target significant insider trading on Wall Street," the government said in announcing the indictments in 2009. "This aggressive use of wiretaps is important," Bharara said at the time. "It shows that we are targeting white collar insider trading rings with the same powerful investigative tools that have worked so successfully against the mob and drug cartels." It takes significant resources to set up and monitor wiretaps, and their use in insider trading cases is an indication of the importance the government has placed on the issue, said Jonathan Marks, a white collar defense attorney and former federal prosecutor. He said the effort was likely influenced by the pervasive public sentiment against Wall Street in recent years, and in particular, the failure to bring major cases in relation to the housing crisis. "There was tremendous pressure to bring cases against Wall Street big-wigs, and this was a pretty obvious way to do it," Marks said. Whatever the origins of the insider trading push, it has clearly been gathering momentum. In April, Rajat Gupta, the government's highest-profile target yet, is set to stand trial. Gupta, a former director at Goldman Sachs (GS, Fortune 500) and Procter & Gamble (PG, Fortune 500), was ensared allegedly divulging inside information on the wiretaps set up in the Rajaratnam investigation. As the Rajaratnam case demonstrated, wiretap evidence helps prosecutors overcome a key hurdle in insider trading prosecutions: proving that defendants knew they were trading on insider information. Law enforcement officials have also been able to use such evidence to convince players in insider trading schemes to cooperate with the government, recording conversations and providing evidence against co-conspirators ahead of trial. "It's more difficult without a cooperator or a recording of some type to explain to a jury that this was not just the normal way of trading -- this trading was catapulted by insider information," said Michael Bachner, a white collar defense attorney in New York City. Defendants have struck plea bargains in large numbers over the course of the crackdown, Marks noted, providing evidence that's allowed the government to target new suspects without opening whole new investigations. In the indictments announced earlier this month, for example, three investment analysts provided evidence against the other four men allegedly involved in the scheme -- in some cases, their co-workers. "Each wave of charges and arrests seems to produce leads to the next phase," Janice Fedarcyk of the FBI's New York field office said in announcing the indictments. Operation Perfect Hedge, she added, "is far from over."